Over the course of what I hope was our last snowed-in weekend this spring, Jamie had his heart set on apple pie. Since we didn't have any apples in the house, and I really wasn't willing to leave the warmth of home - or my pajamas - to go shopping for apples in a snowstorm (and neither was he! ), I baked him a blueberry crumble instead, with some frozen blueberries we had on hand. Of course, it was just as yummy and satisfying, but that apple pie craving was still there, so I promised him that for next weekend's dessert, I would bake him an apple pie. Few desserts are as satisfying as a well-made fruit pie, since it has just about everything I could want in a dessert (unless what I'm wanting is chocolate...). 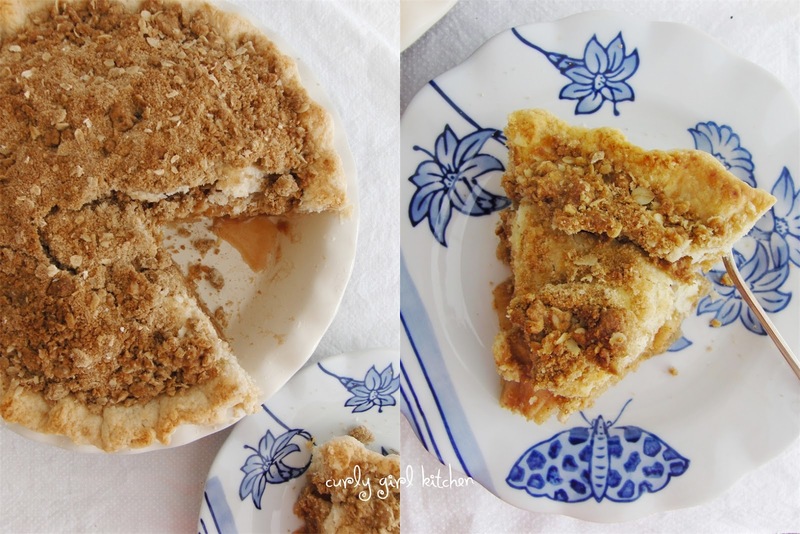 Tart, juicy apples inside buttery, flaky pie crust, and a slightly salty, crumbly oat and brown sugar topping. It's all the more perfect with a scoop of ice cream. My mom loved making apple pies when I was a kid, and for Thanksgiving and Christmas, she'd always make two, one of which we had permission to cut for breakfast that morning (a rare occasion where dessert was allowed for breakfast). 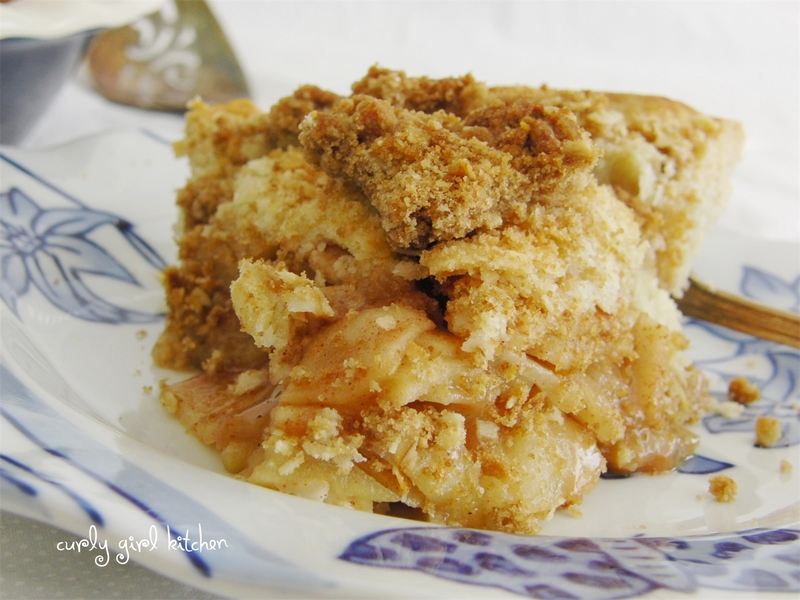 With apple pie, there are two schools of thought when it comes to the filling - to cook the filling before baking or not? My mom always cooked her filling the night before, until the apples were very, very soft, then let it cool overnight before filling and baking the pies the next day. She had two reasons for doing this - she hated it when the apples were still firm after baking the pie, and she didn't care for the way there was sometimes a gap under the crust as the mounded up apples settled down during baking. So if they were cooked before hand, then they were the exact texture that she wanted and they wouldn't settle during baking. My personal preference is not to cook the apple pie filling first, which is actually the opposite of how I make other fruit pies. When making blueberry, cherry, peach, etc... pies, I like to cook the filling first, because I find that the fruit releases so much juice during baking, that it doesn't always thicken as much as I would like during the baking process, so I cook it first to ensure that it's properly thickened before hand, and then I know that it will bake perfectly. But with apples, they don't release quite as much juice, and I find that I prefer the texture more when I don't bake the apples first. 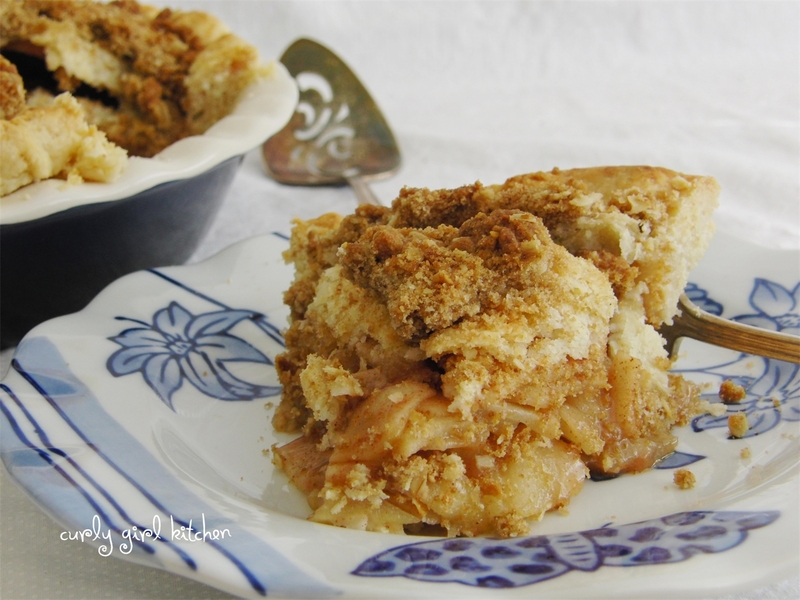 This pie is baked for over an hour and the apples are sliced very thin, so they are certainly not firm or crunchy by any standards, and to me they are just soft enough with the right amount of texture, so that the filling isn't bordering on the consistency of applesauce. A little cinnamon, brown sugar and lemon juice is all the filling really needs - what I want to taste is the tartness of the apples, not an overwhelming amount of sugar and spice - but this is really just a matter of personal preference, the same as your decision whether or not to pre-cook the filling. 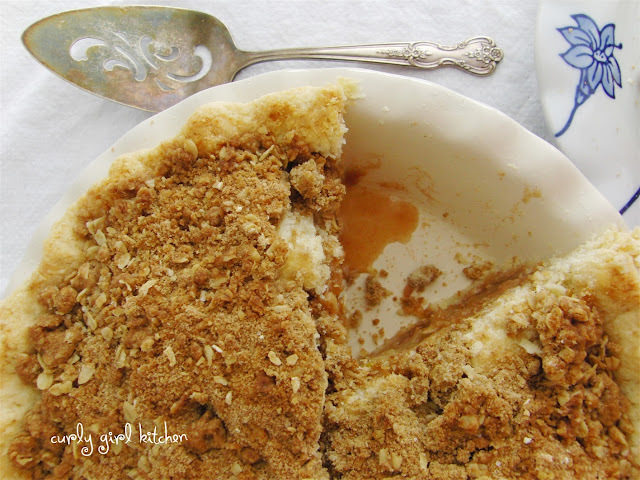 And a crumb topping of butter, sugar, oats, flour and a little salt is my favorite way to top off a fruit pie. In a bowl, combine the flour, sugar and salt. Scatter the cold butter over the flour mixture and cut in with a pastry cutter until pea-sized pieces of butter remain. Sprinkle the ice water over the mixture, a little at a time, tossing with a spoon until slightly moistened. Dump the mixture onto a clean surface and work with your hands until it comes together into a dough. Divide into two equal portions. On a floured surface, roll each portion out to approximately 1/4 inch thick. Fit one sheet of dough into a deep-dish pie pan, letting the excess hang over the edge. Place the other sheet of dough on a plate lined with parchment paper. Set both in the refrigerator until ready to use. Sprinkle the remaining 2 tablespoons flour over the bottom of the crust in the pie pan (to prevent it from becoming soggy). Pile the apples into the crust, mounding them up in the middle. Drape the second sheet of dough over the apples. Press the edges of the two sheets of dough together, tuck them under and crimp the edges with your fingers. Cut several slits in the top sheet of dough to vent steam. Place the pie on a foil-lined baking sheet. Bake at 450 for 20 minutes, then reduce the temperature to 350 and bake for another 45 minutes. 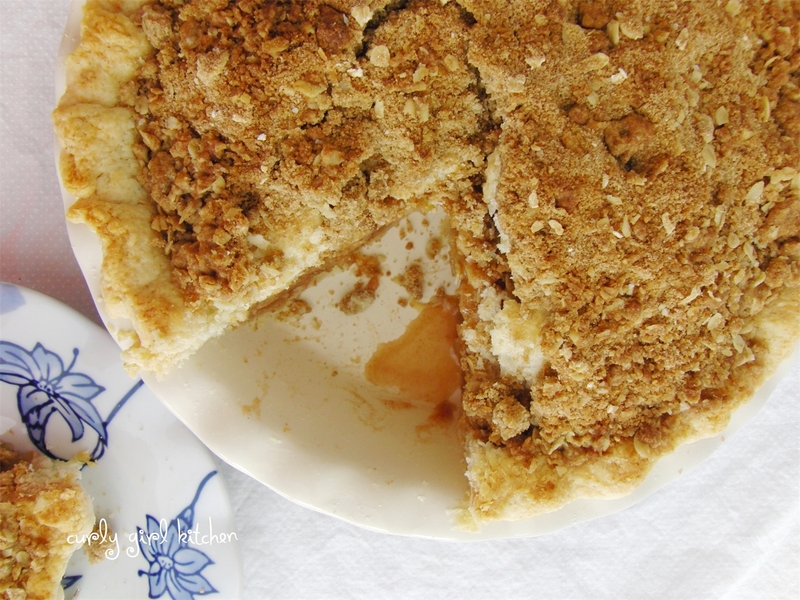 Sprinkle the crumb topping over the top crust during the last 30 minutes of baking. In a bowl, combine the topping ingredients with a pastry cutter until crumbly. During the last 30 minutes of baking the pie, sprinkling the topping over the top crust. At this time, you may also want to cover the edges of the pie with a pie shield to prevent it from over-browning.